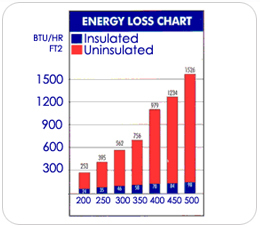 HEAT LOSS - Reduce heat loss as much as 90%. Ignoring exposed areas is no longer cost effective with today's energy problems. SAVE THOUSANDS - of wasted energy (£) pounds and downtime. The philosophy of ignoring exposed valves and other equipment because of frequent maintenance can now be solved economically and efficiently. A Removable and Reusable Insulation cover is the only practical solution.